Katherine Jenkins's Christmas show at Birmingham Symphony Hall is the perfect way to get into the mood for the festive season. The December 17 concert is just one of a number of tinsel-tinged shows at the Birmingham concert venue. There's a Christmas carol singalong on the afternoon of December 18, with classic carols in the evening. On December 23 a Christmas spectacular is hosted by Alan Titchmarsh, then on Christmas Eve afternoon, it's carols by candlelight with the Canzonetta Choir and the Mozart Festival Orchestra. Katherine Jenkins's seasonal special has become an annual favourite at Symphony Hall. The mezzo-soprano mixes traditional music and carols with personal choices she remembers from her early days singing in Welsh churches. She also promises songs like Santa Baby to raise a smile. Her 2017 show features the London Concert Orchestra conducted by Anthony Inglis, with guest vocalist Mark Vincent. The Christmas Carol Singalong, at 2.30pm on December 18, is led by Jonathan Cohen, with guest singer Louise Dearman. The music is provided by the London Concert Orchestra and the London Concert Chorus. There is another chance to sing carols at 7.30pm on December 18. The Classic Carols event features readings by Sir Tony Robinson and carols like O Holy Night and Silent Night led by tenor Nicky Spence and the City of Birmingham Choir. Adrian Lucas conducts the London Concert Orchestra. One of the highlights of the Symphony Hall festive season of shows is the Christmas Spectacular on December 23, at 2.30pm and 7.30pm. Hosted by Alan Titchmarsh, the audience can expect seasonal music, classic hits, thrilling lights and a sensational indoor firework finale, plus high kicks from the Jingle Belles Dancers. The songs and carols include Jingle Bells, Frosty the Snowman, The Twelve Days of Christmas and O Come, all ye Faithful. Vocalists Laura Tebbutt, Anna Patalong and Nico Darmanin join conductor John Rigby, the London Concert Orchestra and the Canzonetta Choir to present an exciting programme that includes Tchaikovsky's Excerpts from The Nutcracker, Adam's O Holy Night and Anderson's A Christmas Festival. 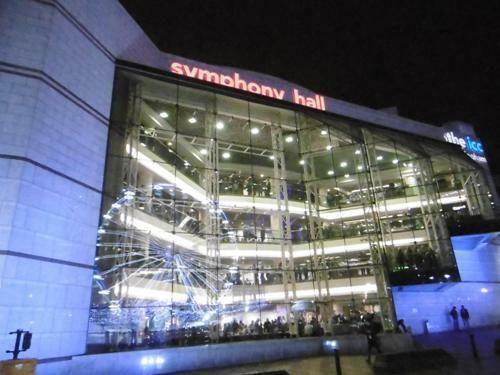 Christmas Eve afternoon is the time to visit Symphony Hall for Carols by Candlelight. Starting at 2.30pm, the concert of carols and seasonal classics features the Mozart Festival Orchestra in full 18th Century costume. The Canzonetta Choir and soprano Nika Gorič will lead renditions of Handel's Christmas sequence from Messiah, Gruber's Silent Nightand Cullen's Joy to the World.